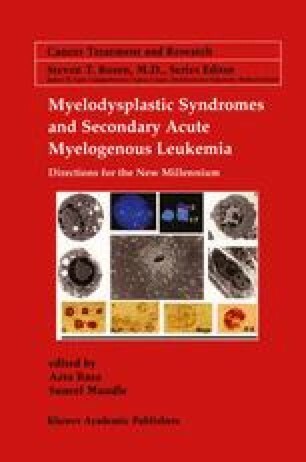 As described in many chapters in this volume it is evident that excessive intramedullary apoptosis constitutes a salient feature of the pathobiology of myelodysplastic syndromes (MDS). Since the first indication of increased apoptosis upon examining the bone marrow (BM) histology in 1990 by Clark and Lampert, followed by histochemical demonstration by our group in 1994–95 ([Mundle et al., 1994a] and [b]; [Raza et al., 1995a] and [b]), a number of studies using a variety of techniques in independent demographic populations around the globe have repeatedly confirmed this finding ([Yoshida & Mufti, 1999]). In spite of such an endorsement, it must be acknowledged that as pointed out by [Dar et al. (1999)], exceptions to this rule showing undetectable apoptosis are also commonly found in MDS. In cases with high apoptosis, the most striking feature is the engagement of all types of hematopoietic and stoma] cells in the apoptotic death process. As a result the presence of an apoptosis-inducing microenvironmental factor(s) with a wide range of target cells was suspected. Different studies have revealed exceedingly high levels of proinflammatory factors like tumor necrosis factor alpha (TNFa), interferon gamma (IFN y), interleukin (IL) 1 and 6, etc. ([Mundle et al., 1996]; [Shetty et al., 1996]; [Kitagawa et al., 1997]; [Gersuk et al., 1998]; [Deeg et al., 2000]). Subsequent studies highlighted TNFa. as probably the most apical trigger of apoptosis in MDS ([Mundle et al., 1999 a] and [b]).